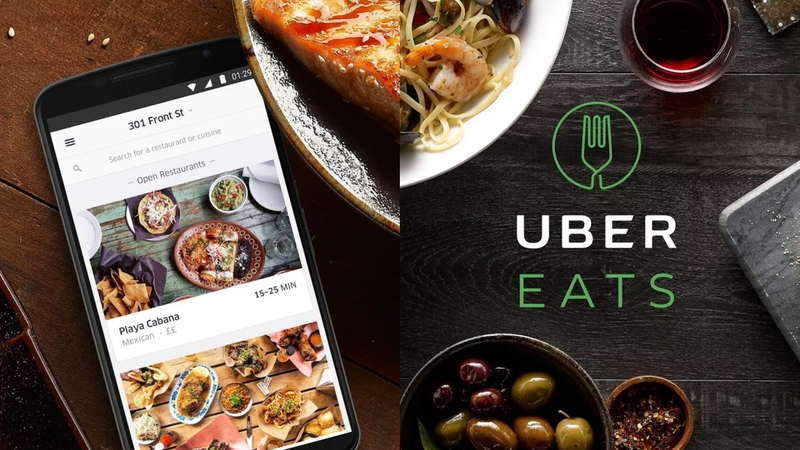 Alma de Cuba, Barclay Prime, Butcher and Singer, Continental Midtown & Martini Bar, The Dandelion, El Rey, El Vez, Jones, Parc, Pizzeria Stella, Route 6 , Route 6 , & Square Burger. Stephen Starr is clearly a dominant force in the Philly restaurant scene. And so it's not surprising that he brought in Chef Douglas Rodriguez to be one of the pillars of the empire, as EC at Alma de Cuba. Raised in Miami to Cuban-born parents, Chef Rodriguez won a slew of awards in the 80's and 90's, with Newsweek selecting him as one of 100 Americans that would influence the millennium. Designated as a super chef who made Latin food haute, he also won a James Beard Award for Rising Star. But perhaps more prominent to contemporary foodies, he is the chef-mentor who brought eventual Iron Chef Jose Garces to Philly. I first dined at Alma de Cuba a year ago, after the weight of a Michigan Christmas's week of meals. The GF and I decided to do a sampling of some of the smaller tastes from Chef Rodriguez. It wasn't too packed when we stopped by before an 8PM showing of Elf at the Walnut Street Theater. We were on the 3rd floor, which was more of a private space. Fresh pandebono was on offer, delightfully crisp and sweet on the outside with some yeasty cheesiness within. The classic South American bread was made of yucca flour, manchego, and queso blanco, resulting in a gluten-free fluffiness. Who knew gluten-free could actually test good? It came with a wonderfully garlicky chimichurri which tempered that initial attack of sweetness. In ordering the ceviche tasting, we also received a duo of corn - salty, savory, fried corn kernels and buttered popcorn. 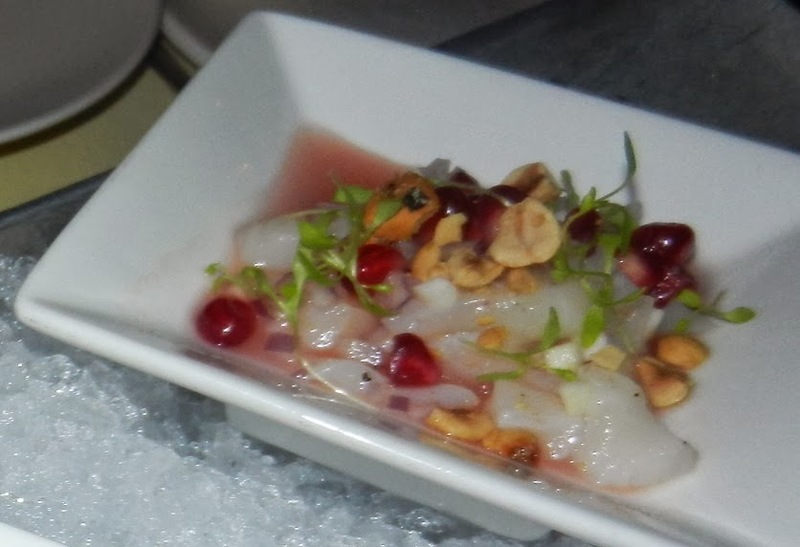 Alma de Cuba offers several ceviche tastings - we went with the smaller on this particular night. You can also opt for 5 for $45 or all 7 for $59. Interestingly enough - they don't offer a tasting of all 8 that are on the menu. 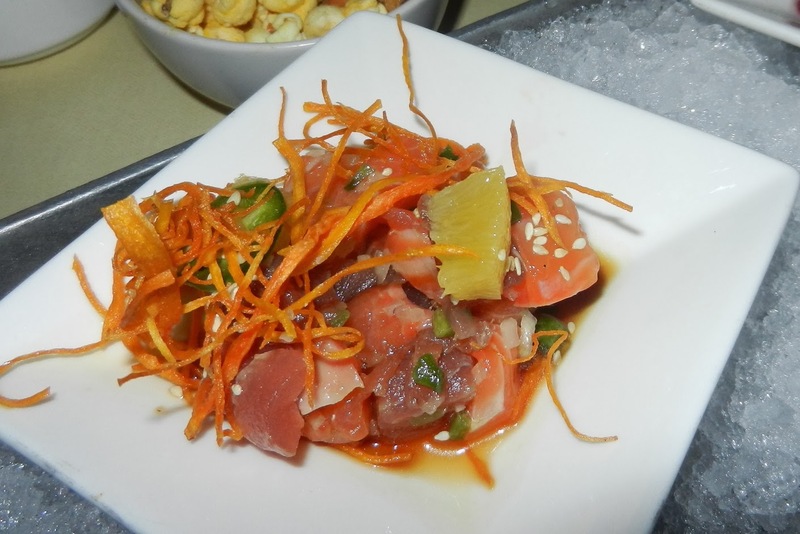 The first of our trio offered fresh slices of tuna ceviche that weren't overly marinated, on top of a puree of avocado. While the tostada was chewier than crisp, the pickled shishito offered some acidity and helped to meld a nice balance of flavor. The heat of the jalapeno and the pop of the line highlighted a nice mix of lean tuna, fatty salmon, and toothsome black bass. The fried sweet potatoes offered some additional texture to each bite. The scallop was a clear favorite - clean, with the leche de tigre providing classic ceviche flavors. The weight of the hazelnut balanced the acidity of pomegranate nicely. In the trio spirit, the GF and I decided to try the Alma sampler, which comes priced per person. And with the arrival of a tower of appetizers, we were instructed to eat in the following order. The empanadas were perfectly fried, with a nice mix of spinach and salty manchego within. An artichoke escabeche was nicely pickled and offered some acidity to the savoriness of the empanadas. 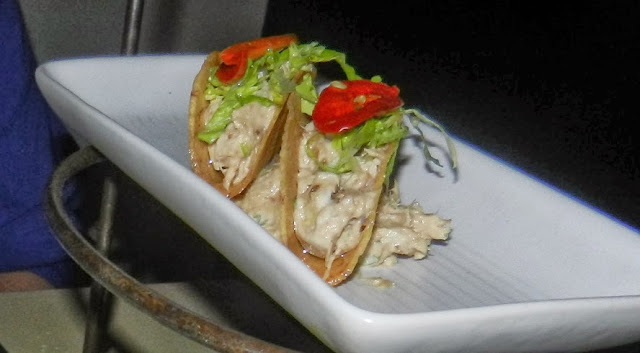 This was an interesting take on fish tacos, with the smoky tuna coated with a tangy, rich mayo. Pickled jalapenos brought the heat, with the malanga providing a nutty flavor. The fattier than crisp bacon had heft, which balanced out the bitterness of the endive nicely. The funky, salty cheese was a nice counterpoint to the sweetness of the date. And if there's black bean soup on the menu, the GF will probably order it. And I'm glad she did! I don't know who Gloria is (Chef Rodriguez's mother? ), but she might have the best black bean soup out there. Not overly salty, the soup was seasoned nicely and the texture was spot on. The rice croquettes offered some additional substance to each bite, with the crema providing some cool lightness. I tried one of their newer additions to the menu. The marrow heightened the richness of the oxtail within the crisply fried croquettes. The pickled onions providing the countervailing acidity to balance out each bite. Nice. And if you have dinner here, you almost have to order this award winning dessert. An ode to Miami and Cuba to be sure, moist almond cake is wrapped in chocolate mousse and dusted with even more chocolate. The matches are made of sugar cane doused in a bit of alcohol to light, with a cracker serving as the match box. A scoop of the dulce de leche ice cream provided sweet richness that complemented each bite of the cake nicely. So if you're looking for fresh ceviche and thoughtfully executed dishes, look no further than Alma de Cuba. It's clear why Iron Chef Jose Garces has become the force that he is, thanks to the mentorship under Chef Douglas Rodriguez. Texture, tastes, and balance are all there - in a Stephen Starr setting no less.